Futons aren’t exactly known for being the most comfortable places to sleep. When you hear the word “futon”, you probably think of something you had in your college dorm room, or the thing in your basement you only use when you have too many guests. But there are plenty of good futon mattresses out there. You just have to know what to look for when shopping for a new futon mattress. In this ultimate futon mattress buying guide, we’ll show you how to find the best futon mattress so you or your guests can sleep soundly even on a futon. There are four main types of mattresses available for futons. When shopping for a futon mattress, you’ll have to choose between spring mattresses, foam mattresses, cotton mattresses, and mattresses that combine foam and cotton to form a hybrid foam/cotton mattress. Let’s review the pros and cons of each of these types of futon mattresses. Spring mattresses are the old standard for bed mattresses, though they may soon be completely replaced by memory foam mattresses. These mattresses are made with metal (usually steel) coils topped with a quilted layer. This ensures that the mattress stays firm and, well, spring-y, but is still comfortable. Spring mattresses are reasonably priced for the most part, though not as cheap as some other types of futon mattresses (more on those later). They are also fairly comfortable for sleeping, and a spring mattress is what many people are used to sleeping on in bed. On the downside, spring futon mattresses can be bulky. 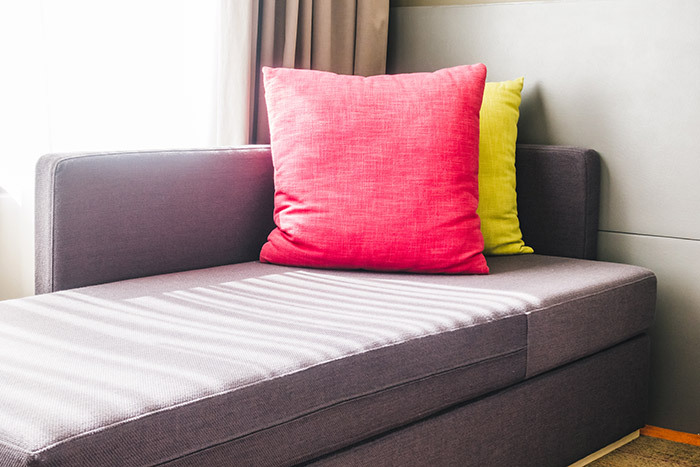 If you have a convertible couch/sleeper sofa futon, a spring mattress can be hard to convert to the sitting position. Not only are spring mattresses heavier than other models, they are also more difficult to fold. Foam mattresses are, in many ways, the new gold standard for mattresses. Memory foam mattresses have become especially popular in recent years, and a large number of people are switching out their old spring mattresses for memory foam. Foam futon mattresses, however, are not always made of high quality memory foam, but they still have some advantages. Foam mattresses are the most comfortable type of futon mattress according to most users. They are best at providing support for your body, whether you sleep on your back, side, or stomach. Unlike spring mattresses, which can offer uneven support due to the coils, foam mattresses are supportive all over. Foam futon mattresses also last longer than other types of futon mattresses. There are some negatives to buying a foam futon mattress, however. Foam mattresses are more expensive than other types of futon mattresses. For a mattress you’re not using every night, a foam futon mattress can be too expensive for many consumers. Cotton futon mattresses are a good option for those on a budget. They’re not as sturdy as spring or foam futon mattresses, but they do have some good qualities. Cotton mattresses are lightweight and very easy to fold up into a sitting position on your futon. However, cotton mattresses just don’t offer the same quality as spring and foam mattresses in many respects. They wear down quicker than other mattresses, and don’t provide as much support as spring or foam mattresses. Futon mattresses that combine foam and cotton can be the best of both worlds in many ways. They’re more comfortable and supportive than plain cotton mattresses, and they’ll last longer. But on the other hand, they aren’t quite as comfortable or supportive as a foam mattress and they’re not as cheap as cotton mattresses. Which Futon Mattress is Best? Finding the perfect futon mattress is personal, and the best mattress for someone else might not be the best mattress for you. There are some general guidelines, though. If you’re going to use your mattress as a bed more than a couch and want a comfortable mattress without breaking the bank, try a spring futon mattress. If you want the most comfortable mattress and want to be able to fold it for sitting on, a foam mattress is your best choice. Cotton mattresses are fine for those who don’t plan to use their futon often and want something inexpensive. And finally, a cotton/foam mattress is good if you want to get a decent amount of use out of your futon but still want to save some money.